Messy car, too much travel trash, busy family, snacking children? Finally an answer to your perpetual vehicle mess. Clean Ridez has the solution to the constant accumulation of trash in your vehicle. This 2 Gallon leak proof, EASY ACCESS trash bin hides unsightly garbage in a durable, attractive enclosure. 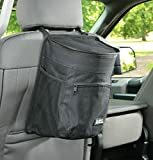 The adjustable nylon straps secure to any headrest while 2 velcro strips secure the back of the bag to the seat to avoid swinging and bouncing. The 2 gallon vinyl nylon liner is removable and washable for easy empty. No more digging for a plastic bag to “clean out the car.” For use: Fasten the Litter Bin straps around the headrest of your automobile. The Litter Bin can hang on the front of your passenger seat for solo travel or on back of any seat for group travel. Adjust the nylon straps to an easy reach length then secure the velcro strips so that the bag stays put during turns or sudden stops. To empty the bin simply remove the inner nylon liner. When needed the liner may be rinsed or wiped clean. Allow liner to completely dry before replacing the it. 90 Day MONEY BACK GUARANTEE!! If for any reason you are not 100% satisfied with your Clean Ridez purchase simply return the product within 90 days of purchase and we will refund your money. NO Questions Asked! What are you waiting for? It’s time to CLEAN YOUR RIDE! Great for kids or if you just want to keep your RIDE CLEAN! CLICK ADD TO CART and Get Yours NOW!! FLIP OPEN LID keeps unsightly trash concealed without the hassle of fighting with difficult fasteners. This bag is designed for easy use while driving. EASY CLEAN 2-gallon vinyl liner bag is Leakproof | Removable | Washable | Reusable because disposable bags NEVER fit right and just don’t stay in place!- The Clean Ridez bag can even be used as a cooler or for extra storage! A LITTLE EXTRA AUTO STORAGE – Netted side pouches hold water bottles or other containers. Front zipper pouch for holding sanitizer, wipes or even organizing small items. SECURE PLACEMENT – Adjustable quick-click straps for seat back or seat front and velcro fasteners to prevent your bag from swinging or bouncing during turns or sudden stops. PERFECTLY SIZED – QUALITY DESIGN – Our Customer Reviews agree that our bag is PERFECTLY SIZED, Stylish and Rugged! Constructed from Ripstop Nylon with reinforced stitching that will last a Lifetime! We Guarantee It!